I love your style Lissa. I'd love to enhanced stash with your background fabric. I am cleaning out my craft room now, and have made some space! Ohhhh nooo, a donation to the Goodwill? Argh! That would be tough to get over. 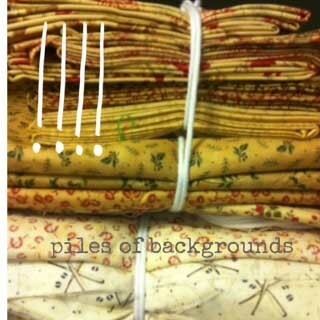 Hopefully a quilter needing great backgrounds picked it up and really appreciated your selections. I've been quilting for three years, mainly kits. Recently I have become obsessed with scrap quilts only to realize I NEED background fabrics to make that happen. Winning your giveaway would be a big step forward on that journey. Thanks for the chance. I love backgrounds too. Thanks for being so generous with your de-stashing project! This has been so much fun, your randomness and your great piles of yummy fabric. Thanks for sharing. Background/Neutrals are not something I often stash but are so necessary. Thanks for the awesome giveaways! I try to buy backgrounds, but those novelty call out to me! Lol.i would be so heart broken if some of my stash went to Goodwill, sorry that happened! I tend to buy fabric on impulse, and lights are not usually things that catch my eye that want to come home with me. I have been trying to do better as i want to use them in scrap quilts. Oh wow – this would be perfect! What a pretty stack. Thanks for the chance to win some great neutrals! I love scrappy too! I love all fabrics of all colors and would love to add these to my stash. Love those, I really like combining lots of different backgrounds to make a more interesting quilt! Definitely always room for background fabrics! I just watched my son pull out of the driveway going back to college…on the other side of the country! I'm in VA and he is in school in CO! I miss him already! I better head to my sewing room for some fabric therapy! I NEED lights for a quilt I'm working on now!! When we stay at our mountain trailer I don't take a lot of extra boxes to bring stuff home in and end up using lots of the black garbage bags for dirty clothes, overflow kitchen supplies, arts and crafts, just about anything, including the garbage. Then just before we turn onto the highway we stop at the public garbage bins. I've lost more stuff there! Hubby just grabs black bags and tosses and by the time I've got everything packed, I'm mostly brain dead! Now I try to separate better and also use white garbage bags for my keep til we get homes. Love the fabric. Thanks. I go through lights and neutrals faster than anything, and I love scrappy. Your purged fabrics would be welcome in my home. I'm in the middle of collecting fabric for an incredible autumn wall hanging quilt and can you believe I went to my favorite quilt store and nothing! I just needed a really good neutral for some flying geese and not one to be found! I just started my first scrap quilt and discovered that I need more background fabrics. Quilting is my therapy! Thanks for the chance to win! Getting a happy in the mail is always a fun thing. I'll keep my eyes peeled! nice fabrics and love these give-aways. What a nice thing for you to do…..so, I guess quilting is like a drug or ADDICTION….just start and you are hooked. Always am looking for that right piece of fabric! I really need some background fabrics in my stash as aim a relatively new, quilter, 2 years. I've been using almost all neutrals as backgrounds lately, Love them. Sorry to hear about the Mystery of the Disappearing Black Bag! My Mom has a similar story of a plaque on the wall that also disappeared. When she asked my Dad, a funny look came over his face, but he denied all knowledge of the plaque. She thinks it fell on the floor and broke and he just swept it up and threw it away not thinking it could be repaired and re-hung. My brothers also denied any knowledge. I was off the hook, away at college. Thanks so much for your generosity – I could really use some backgrounds for my Jamestown Crossing quilt from the Bonnie Hunter workshop this weekend. So generous of you to free this fabric so that someone else (hopefully me) can give it life in a quilt. Thank you for a chance to win. I am lacking light background fabrics. I always tend to choose the more exciting midtones. I have made a rule for myself that when I go fabric shopping I have to buy at least one FQ of light fabric. PLease toss my name into the 'hat'…. and thank you for sharing your over-flow. I have really been wanting to make a low volume quilt and this would make the perfect start. Yea for backgrounds! Always needed! Thanks for the giveaway! It's always fun to play with another quilters stash.